Red Rock Press - Celebration! 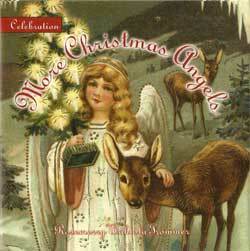 A brief and delightful history of Christmastime angels and their music and magical errands. Our award-winning poet tells their story with the help of dozens of colorful images gathered from around the world. Open this book and you'll be enchanted both by the loveliness of Ms. Trommer's writing and the antique holiday art depicting the beauty of angels from their halos to the tips of their wings. Rosemerry Wahtola Trommer spins her magical prose from her often snow-covered home high in the mountains of Colorado. 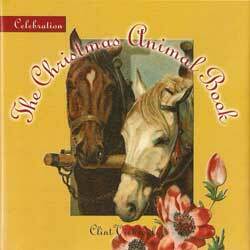 Among her earlier books is Celebration: The Christmas Candle Book, a volume of sparkling holiday poems. 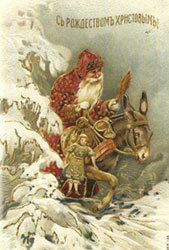 On Christmas Eve, Santa will pat his flying reindeer and climb into his sleigh---as always. As always? Not exactly. 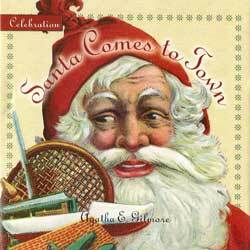 Santa, explains journalist Aggie Gilmore, has been depicted riding a donkey or a goat, or even—nearly a century ago—piloting one of those new-fangled airplanes. The Santa of old stories and illustrations is not always round and jolly, and it took several centuries for him to add a fur-trimmed red suit to his wardrobe. This is a little book full of big surprises. Ancient Celts told an odd story about mistletoe. The New World flower, poinsettia, has almost magical Yuletide significance. A rose was not just a rose to the Victorians who considered roses, along with daisies and forget-me-nots, important Christmas flowers with layers of meanings. 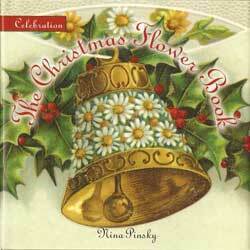 This charming book, illustrated with antique Christmas-cards, decodes the meanings of the holiday greens and blossoms with which we decorate our homes. 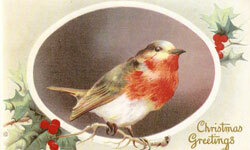 Dozens of tame or wild animals and birds, especially, have had Christmas roles. 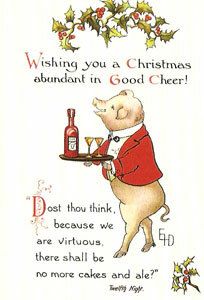 Paintings of farm animals and woodland creatures at holiday-time are a charming holiday legacy. Occasionally, we see animals all dressed up like people for Christmas. More often, they're part of a bucolic Noel scene. Seattle native and retired airline pilot Clint Viebrock still travels the world, alighting in the Northwest or Telluride, CO for the holidays. 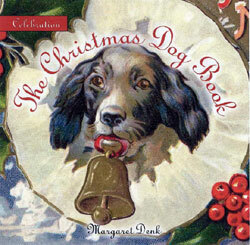 The Christmas Dog Book revolves around a collection of antique Christmas cards, accompanied by brief narratives explaining dogs’ passage from the kennel to the heart of families’ Christmas celebrations. In this lovely 5½ by 5 ½ inch, 64-page hardcover, with dust jacket,. Christmas pups guard Christmas stockings or toast each other. In this lively book, a match in classy, colorful style to The Christmas Dog Book, the author uses Christmas card images from about 1885 to 1930 to chronicle Christmas cats. 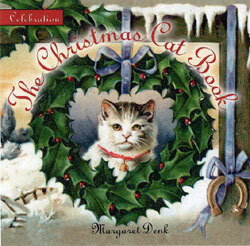 Chapter 1 looks at "Cozy Christmas Cats," beloved by Victorians and many pretty women. Chapter 2 considers the "Good-Luck Black Cat," Chapter 3 looks at "Almost Human Christmas Cats," busy with chores and full of cheeky charm. Margaret Denk, a Chicago-based producer of short films, loves both cats and dogs. Choose Here Comes the Snow by Rosemarie Jarsksi for brilliant insights into, and extraordinary photographs of, white crystalline glory. Hardcover $9.95. And discover The Christmas Candle Book with poems of light!by Rosemerry Wahtola Trommer — a stocking stuffer or perfect present for someone on your Christmas list. This poetic volume displays full-color antique Christmas cards featuring candlelight, collected the world over; each accompanied by original and joyous lyrics, Hardcover $9.95. Once upon a time Santa Claus wore robes of many colors and had several modes of transportation. 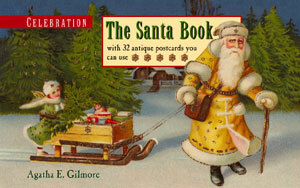 Santa's newest biographer, Aggie Gilmore, reveals many surprises about Santa's past in presenting this unique collection of antique Christmas cards gathered from around the world. 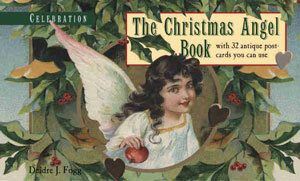 This book is a treasure for a collector of Christmas memorabilia. It is set up so that each of its 32 cards may be detached and used. Charles Dickens' first Christmas tale is republished with an introduction by Dickens' biographer Peter Ackroyd, a suite of commissioned oil paintings and Dickens' family holiday recipes. An old menorah, discovered by two adventurous children, lends light, sparkle and magic to a village gone gray with modern woes. If you'd like to turn the pages of any book described above, you can buy it on Amazon or request it directly from Sales@redrockpress.com, with a valid credit card.